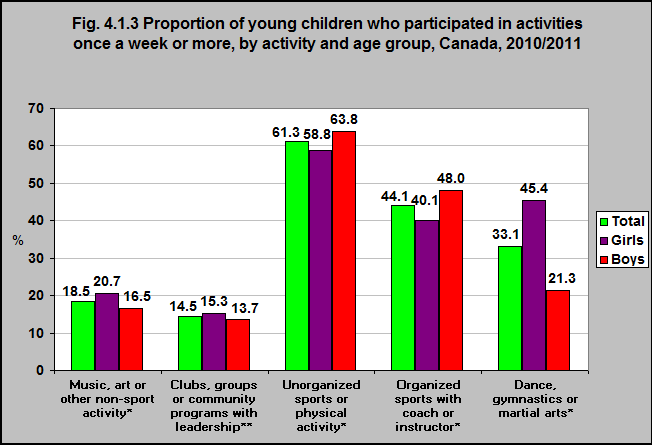 Almost half of 3 to 5 year olds in Canada take part in sports with a coach or instructor (except dance, gymnastics or martial arts) once per week or more. Over 60% take part in unorganized sports or physical activities without a coach or instructor once per week or more. One-third take lessons or instruction in other organized physical activities with a coach or instructor such as dance, gymnastics or martial arts. Less than 20% participate in music, art or other non-sport activity or clubs/groups. Girls are more likely than boys to take part in dance, gymnastics or martial arts. Boys are more likely to take part in organized sports with a coach or instructor. 1Child Trends. 5 Ways the Arts are Good for Kids. 2017. https://www.childtrends.org/child-trends-5/5-ways-arts-good-kids/ -accessed July 24, 2017. 2Torjman, S. Culture and Recreation: Links to Well-Being. Caledon Institute of Social Policy. 2004. http://www.caledoninst.org/Publications/PDF/472ENG.pdf -accessed July 24, 2017.